Spiritual ammunition for the law enforcement community. Law enforcement officers face pressures and dangers from many angles every day. Behind the Badge provides daily spiritual nourishment for officers written by someone who has been in their shoes. When was the last time you left home for work knowing there was a risk you could be killed? Over 75% of law enforcement officers are divorced, 30% deal with alcohol abuse, and suicide is the number one cause of death in law enforcement. There is hope for every law enforcement officer facing difficult times. Behind the Badge will be the constant reminder of the permanent backup each officer has no matter what shift they work. 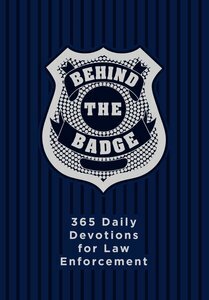 About "Behind the Badge - For America's Law Enforcement (365 Daily Devotions Series)"